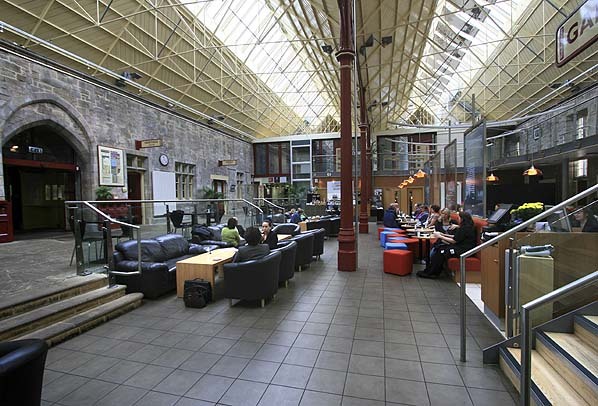 Present state: The Grade II* listed building has been fully restored as a leisure facility. 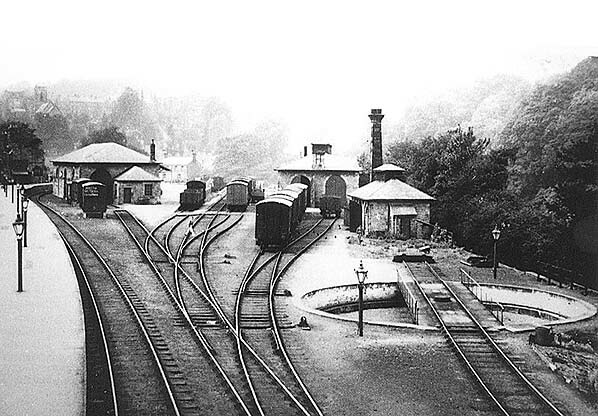 As well as the station the engine shed, gas works, stationmaster's house and railway cottages are all extant. Notes: The main station building was the work of the architect GT Andrews of York and was specifically designed to blend in with the buildings and character of this historic market town. The two ridge train shed covered a platform line and two sidings. These sidings often used to house NE horseboxes hired out to local trainers for their racehorses. Often the boxes displayed the name of the hirer and the home station in gold lettering on the door panel. The original platform was both low and short, extending only a short distance outside the train shed. At the main entrance there was a carriage porch where a horse and carriage or motor vehicle could stop in order for the occupants to alight under cover, protected from the weather. The train shed was open at the south end and lit by gas; electricity not being provided until after WW2. 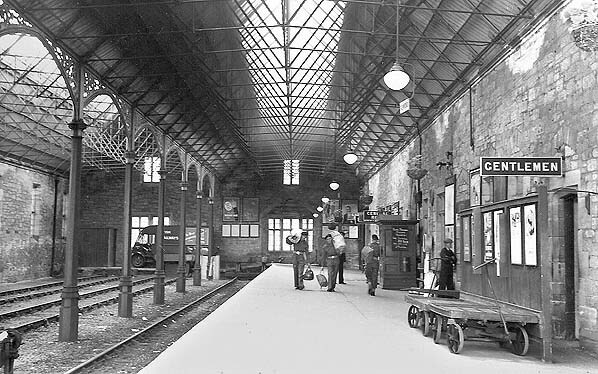 Within the train shed the following rooms were provided: booking office, general waiting room (later incorporated into an enlarged parcels office), ladies waiting room, refreshment room (later the waiting room), parcels office (later enlarged), stationmaster’soffice, porter’s room and toilets. At a later date a wooden ticket collectors booth was provided next to the main entrance and in the 20th century there was a small wooden bookstall operated by WH Smiths, which closed in 1940. Few substantial alterations were made to the station building over the years other than lengthening the platform in 1860 when the front edge was raised resulting in a downward slope towards the floor level of the offices, which survived until the recent renovations. 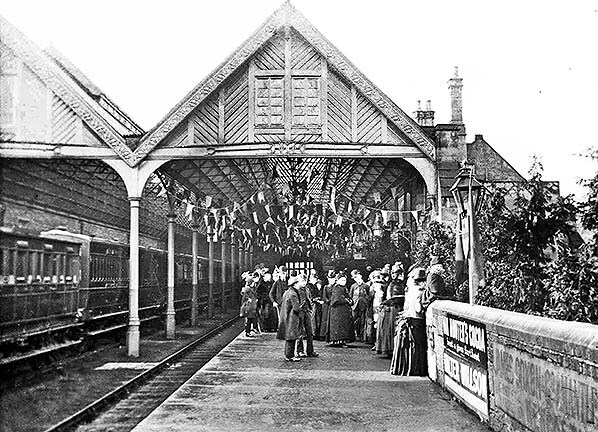 The platform was further lengthened in 1892 and again 1915 to cope with the increased military traffic from the newly established Catterick Camp and in its final form was 268 yards long. The rearrangements of the offices and waiting rooms was carried out during the First World War, and at about the same time the large window at the buffer stop end of the platform was opened up to create a large door for handling parcels traffic. The station bookstall was removed in 1940 and during the Second World War the stationmaster's office was requisitioned by the army as the Railway Transport Officer (RTO) Office. The RTO also had a temporary wooden office under the carriage porch. Electric lighting was finally installed in the late 1940s, but apart from that little was spent on the building in British Railways days. 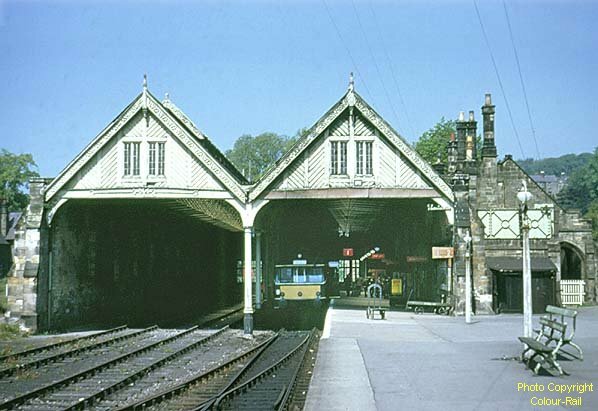 In the 1950s the rotten wooden screen above the platform line was patched with zinc sheeting, and by the time of closure there were gaps in the wooden screen, smoke louvers and roof lights. 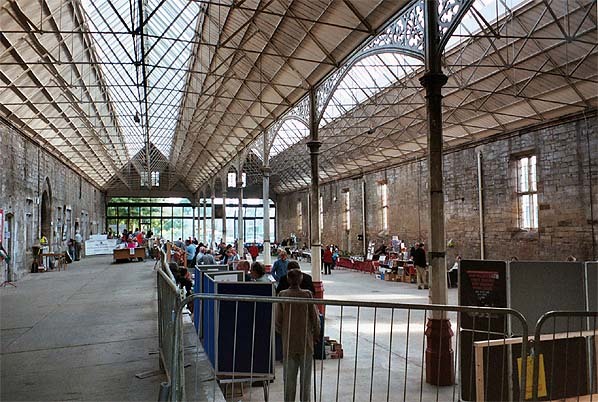 A large goods shed (now the site of the swimming pool), two road engine shed (now a fitness centre). One of the shed’s roads was a through road, giving access to the coal depot. There was a 45 ft turntable, situated on an outside line near the engine shed. In April 1877 a request was made for a replacement for the original, reportedly worn out, turntable. The decision was taken to work the branch with tank engines rather than replace the turntable, this decision was rescinded a few years later and a new Lanson turntable was installed. Other buildings included gasworks to provide gas for the lighting; this was sometimes referred to as the pump house and is currently derelict. There was a signal box of the early type of the NER Southern Division architecture, this was sited on the south side of the line close by the railway cottages and was demolished in 1968. There was also a water pumping station, 50 coal drops (now the site of the car park) and a 3-ton crane. Staff accommodation included a stationmaster's house, goods agent’s house, two goods staff cottages, one being the depot managers house at the entrance to the coal yard and 6 staff cottages. As there was no road access to the station the railway constructed a road bridge over the River Swale and built a road up in to the town to provide access to the station. This bridge with 4 gothic arches of 52 feet span and 10 feet rise was designed by Robert Stephenson, Engineer–in-Chief of the York & Newcastle Railway (Although some sources credit GT Andrews). This bridge was almost unique in that it was a railway owned bridge carrying a road over a river. For 70 years the road over the bridge served only the station but with the building of the Catterick Camp a link was made with the Richmond to Catterick road. The bridge, known simply as Station Bridge,It was taken over by the Town Council about 1920 but still retains its North Eastern Railway bridge plates ' No 8'. This bridge is now known as Mercury Bridge in honour of the close association between the town and the Royal Corps of Signals. Goods traffic was withdrawn on 2nd October 1967 and this enabled the railway to lift all the sidings, including the two in the train shed, and remove all the signals. All points were secured out of use in the normal position, pending removal. 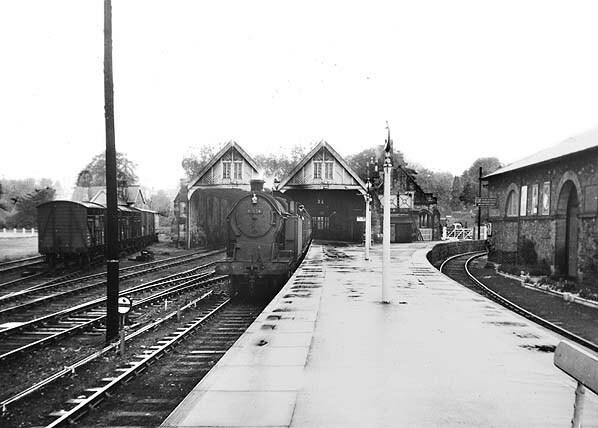 Before proceeding from Richmond station the guard had to receive assurance from the Catterick Bridge signalman that the gates at Broken Brae and Parkgate Lane level crossings were secured across the roads. In August 1968, Richmond signal box and the 1942 water column on the station platform were demolished and redundant track removed. The station was finally closed on 3 March 1969 but before the line was closed the station was included in the list of buildings of Special Architectural or Historic Interest, it is now Grade II* listed. After closure the remaining track was lifted and the building lay derelict until the whole site was acquired by the District Council. including the bridge which continues to form part of the main road between Richmond and Catterick Garrison, the A6136. Eventually the passenger terminus became a popular farm and garden centre, though it closed in 2001. In 2003 a community-based project to regenerate the station was given the go ahead. The aims of the project, which was spearheaded by the Richmondshire Building Preservation Trust, were "to provide activities and recreational spaces that will meet established local demands at affordable prices. To include a limited number of commercial operations sufficient to generate an income to maintain the project and subsidise community activities on site. To include at least one use that will attract substantial numbers of visitors to provide the building tenants, and (as a consequence) the building management, with income." with photographs by railway photographer Maurice Burns. Additional source Wikipedia, some text reproduced under Creative Commons Licence. See also Richmond Station web site. The station is open every day except Christmas Day, from 0900 to 2300. The food units in The Station, which are run by independent traders, have their own hours. The first soldiers arrived at the camp in October 1916 and troop traffic was immediately very heavy with seven passenger trains operating between Catterick Bridge and the camp, the last two running through to California. Five trains ran in the opposite direction with an extra train at lunch time on Saturday although no trains ran from California. 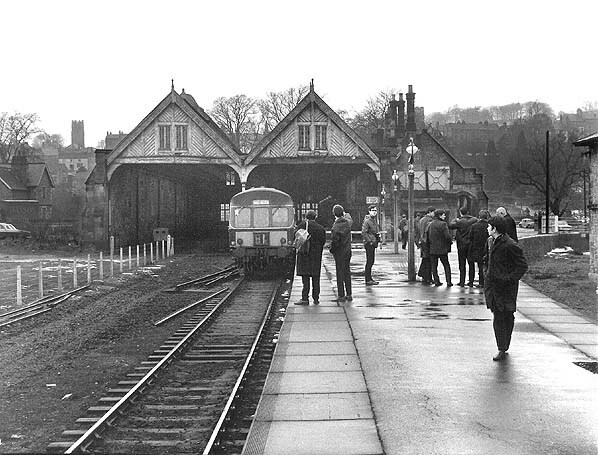 On Sundays there were two trains between Catterick Bridge and Camp Centre. 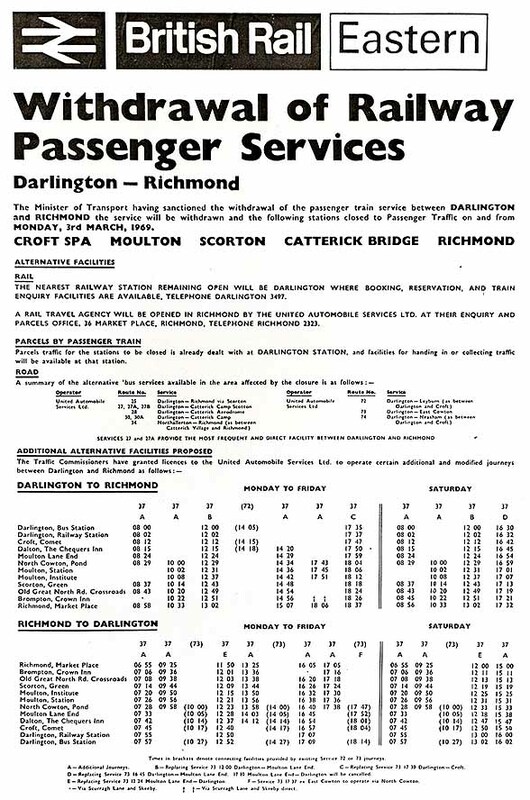 Some trains between Camp Centre and Darlington were combined with trains for Richmond dividing at Catterick Bridge where the camp's own tank engine was waiting to haul the detached coaches on to Camp Centre. The camp's tank engine was kept in a 2-road corrugated iron shed opened in 1915. It stood south west of Walkerville Crossing and closed in c.1925. Croft Spa, Eryholme, Moulton & Scorton. 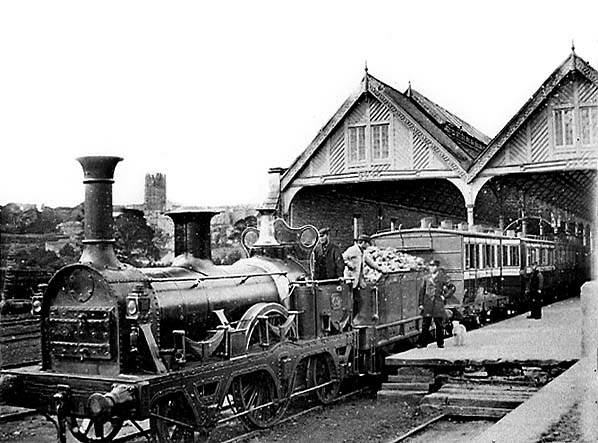 Richmond Station c.1865 after first lengthening of the platform. Richmond station sometime around the turn of the 20th century and possibly during 1903. 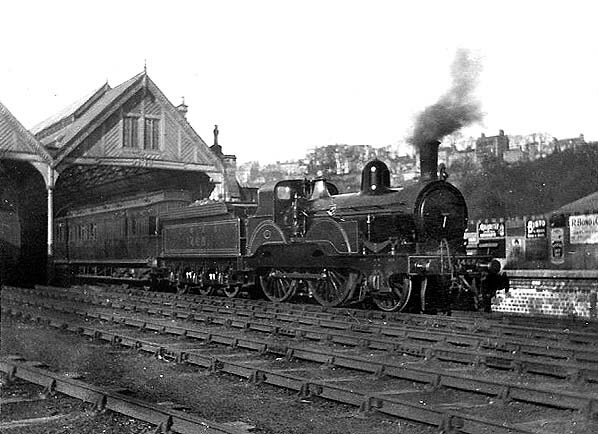 Features of note are the sloped-back platform, the result of the platform edge being raised in or around 1860, and the North Eastern stock stabled on the left. It comprises six and probably four-wheeled stock including what appears to be a six-wheel luggage brake. Livery would have been deep crimson, sometimes referred to as 'plum'. It has been suggested it was the funeral of a eminent person but this can, with reservation, be discounted as the bunting and dress are not appropriate for a funeral at this period. It can be seen that two of the women are wearing bustles (a type of skirt support) and investigations reveal the bustles are of a less prominent style worn during the very early years of the 20th century before the fashion disappeared altogether around 1905. Click here for a larger version of the picture with a more detailed caption. shed (centre) and gas works (right). 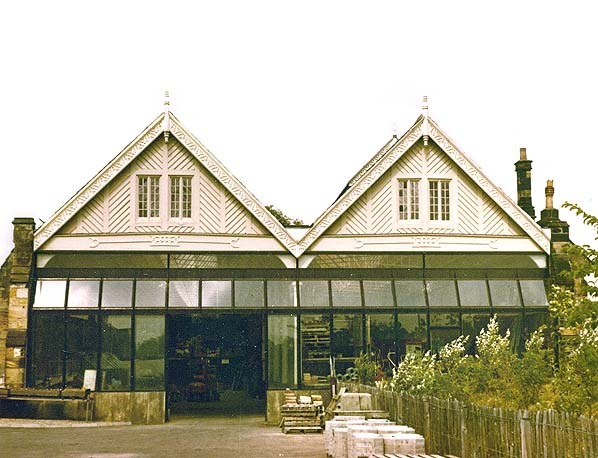 Richmond Station in July 1978, at this time the station was used as a garden centre. Richmond Station in September 2005 during a ‘Rail Fayre’ organised to raise money and publicity for the subsequent restoration of the station seen below.